|Home |Tours |Flights |Hotels |Cruises |Ski |Terms conditions |Request |Who are we? 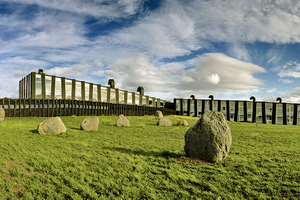 The Remota Hotel in Patagonia is located in the town of Puerto Natales, in the Seno de Ultima Esperanza province, the best starting place to visit the area. It has a privileged location by the ocean at the starting point of the amazing mountains, lakes and glaciers of the Chilean Patagonia. 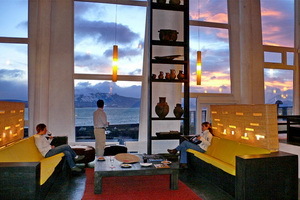 Located only 158 miles from Punta Arenas and 93 miles from the Torres del Paine national park. 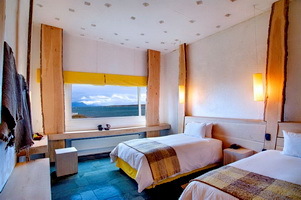 Remota Hotel, has 72 rooms, all with a view of Ultima Esperanza bay, the Balmaceda glacier and the Paine Mountain Range. Each room has 344 square feet and has a private bath, direct dial phone and safe; two meeting halls: 1900 and 1,470 square feet respectively as well as a restaurant and bar. There is an additional complex with an indoor pool, sauna and Jacuzzi. 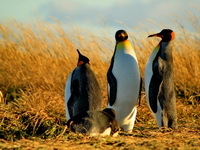 We have 3, 4 and 7 day programs with set arrival and departure to discover the Chilean Patagonia. To achieve the perfect experience, we have a 72 room hotel and comfortable all terrain vehicles for outings and excursions. 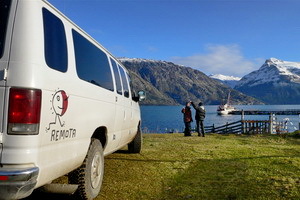 Transport between Punta Arena Airport and the Fundador Patagonia Hotel. Shuttle from airport to hotel is between noon and 4pm and from hotel to airport: 8am to 10am. 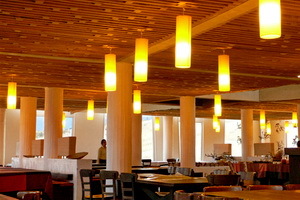 Breakfast, Lunch and Dinner menus that include soft drinks and house wine. 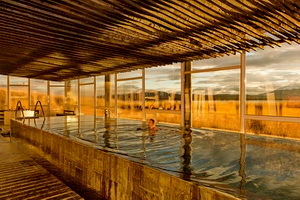 Use of facilities such as: Sauna, outdoor Jacuzzi and indoor pool. 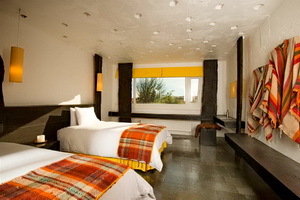 The hotel has a relaxed casual atmosphere so the proper clothing to wear is whatever makes you feel at ease. We recommend that for the outings you dress in layers and include comfortable walking shoes or boots, warm jacket, pants, sunglasses, gloves, hat for the wind, sunscreen and lip balm. And don’t forget your swimsuit for the pool! Gateway to the Torres del Paine National Park, this town of Puerto Natales gazes northward into Chile from its own Strait of Magellan coastline. Ships sailing south from Puerto Montt call at this charming port, bringing tourists with them. Early 20th-century buildings evoke the past when men and women began settling here, thus broadening Chile’s national horizon. We see how the spirit of survival molded the people here, as we see them working in the greenhouses where fruits and vegetables are stored and distributed, and watching fishermen at work supplying centollas (Chilean king crab) and myriad fresh shellfish to this thriving “Magellanic” town. Hiking up through forests of endemic ñirre and lenga trees, we will see condors soaring so close overhead we can hear their powerful wings piercing the air. Then, walking along the ridge with views of endless pampa and its countless lakes, we come to the vestiges of primitive man – his cave paintings. We can imagine how they sheltered themselves against inclement weather inside these caves that nature carved out for them. come to Lake Sofía with splendid views of the valley below. 1895 when he discovered a piece of hide from the prehistoric Milodón animal. We continue through thick brush where we can observe a great variety of birds. We finish the ride inside the vast Cave of the Milodón. Here, in this immense cave, remains of a prehistoric giant herbivorous creature named Milodón Darwinii Listai were found at the end of the 19th century. This discovery awakened curiosity among explorers and naturalists about prehistoric life in Patagonia. Surrealistic and representational cave paintings illustrate a magnificent testimony that man, during a certain period of his evolution, coexisted with prehistoric animals, including the milodón. The adventurous and industrial spirit of the first colonizers is admired in this impressive century-old commercial plant, built in such a remote location, for processing of some 3500 sheep daily for exportation to England. We continue on to the house of Hermann Eberhard, the first colonizer who settled in the province of Última Esperanza. Crossing the Eberhard Fiord in zodiac, we land at the shore of Villa Luisa, site of the first house built in the province. Here we enjoy a typical roasted lamb feast, Patagonia style. We start at a typical estancia (ranch house), then hike up through a forest bordered by a former ocean-bottom landscape that rose up thousands of years ago. At the summit we can find authentic vestiges of geological evolution, then we arrive at a “magic area” which is said to have curative powers. Here we see precious fossils and an inspiring panorama. We begin descent bordering the cornice of the hill while enjoying 360-degree views. We can see the Paine Grande, the Cordillera Sarmiento, Campo de Hielo Sur, and even the shapes and designs of the fiords near Puerto Natales. The ideal way to learn about life in Patagonia is to experience in depth the lifestyle and daily activities of a baqueano (the Chilean version of gaucho, yet with significant differences). This half-day excursion is with an authentic baqueano, riding with him across his land just as he does each morning. Authentic baqueano art will amaze us, just as the unique costume and gear. We will have the privilege of riding the horses of the rancher (estanciero), who will tell us about the ways of life here in the old days. The Tenerife mountain is recognized in the distance by its sharply pointed peak. Hiking toward it, we pass through Patagonian forests with Ciprés de las Guaitecas (endemic cypress trees) until we reach the Río Ventisquero that flows gently down the mountainside. Making our way through humid forests, we admire ornate ferns, mosses, lichens, and even a Magellanic woodpecker. Puerto Natales is the departure point for this boat trip along the entire length of the Seno de Última Esperanza (Last Hope Sound), a relaxing opportunity for uninterrupted sightseeing. Along the way we see dolphins, sea wolves flocks of cormorants, condor nests, and a variety of flora and fauna unique to these Patagonian flatlands, until we arrive at the Balmaceda and Serrano glaciers. A short hike brings us to the vantage point where the edge of the Serrano Glacier, like a giant mountain, touches the sea. One continually hears the sounds of the ice straining, bending, and chunks breaking off. We depart to Lake Sofía and hike along the shore to the Mirador del Cerro Queso. Here we have access to the beautiful beaches on the lake. This excursion starts on the shore of Lake Sofía. We bicycle along the lakeshore for three hours, along forests and sighting condors gliding above. 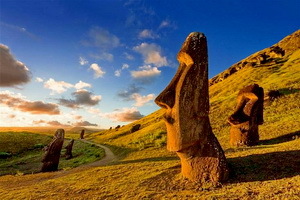 We can view the geological formation of this area, a result of glacier retreat about 15,000 years ago. We also explore natural caves that primitive tribes used for shelter and for expressing their art in magnificent cave paintings. Passing thick jungles of ñirres (endemic trees), we descend to the Seno de Última Esperanza. Bordering the lakeshore we see countless small lagoons that are refuges for wild birds during their nesting period. 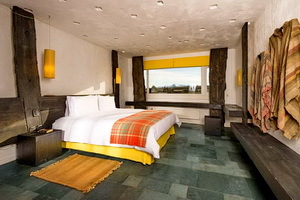 We come to the Estancia Perales with an impressive view of the Cordillera Chacabuco y Sierra Prat. We hike to the Argentine border enjoying marvelous views of the Llanuras de Diana and the Pinto and Balmaceda Lakes. A visit to the interesting Dorotea Museum is included. We hike toward the mirador (lookout point) Cerro Pelario, passing through forests of lenga, ciprés de las Guaitecas, and coigües (endemic species of trees). There are splendid panoramic views of the mountains surrounding Puerto Natales, as well as Golfo Almirante Montt and the Pinto and Balmaceda Lakes. We begin our hike at the Salto Río Ventisquero along a path of beautiful forest with ciruelillo and coigüe (endemic evergreen tree). Arriving at the Mirador de la Sierra Prat we enjoy views of Lake Porteño and the Castillo and Campana mountains. We begin our hike at the eastern skirt of Tenerife Mountain, then proceed through humid Patagonian forests. We hike around a major part of Lake Porteño, home to endemic birds that nest in this area. Along the way we enjoy a direct view of the Macizo de Torres del Paine. Toward the end of our route, the spectacular Gran Lago Toro comes into view. It is the largest lake of the region with lush fauna growing around its shores. A hike along the coasts of Lake Porteño passes through a magic environment where spectacular formations seem to converge: Sierra Baguales, Sierra del Toro, and Paine Grande, the most important peak of the Torres del Paine National Park. By bicycle we border the lake heading toward Puesto Castillo. Departing Remota we pass by Puesto Castillo Viejo where we begin a hike from the Refugio Juvenil Maravilla bordering the lake of the same name, amid typical forests of the area. We continue through Paso de la Guitarra, arriving at the Bay of Los Maitenes, the only place in Patagonia where this tree species is found. This mountain, Cero la Olla, is located in the sector of the Estancia Dos Lagunas, north of Puerto Natales. It is named for its unusual shape, like an olla, or cooking pot, and reaches an altitude of 1,350 meters above sea level, making it one of the principal peaks visible from the town. From here we have a privilidged view of Lake Sofía and the fiord of Última Esperanza. 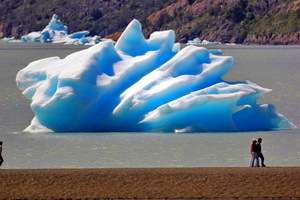 Patagonian Chile is a complex combination of vast plains intersected by glistening lakes whose waters are multicolored because of their mineral contents; of ice fields extending like vast trampolines toward the sea; and gigantic floating icebergs gliding quietly through the cold lakes. Combed by the winds, forests of endemic lenga, ñirre and coigüe trees are beautiful throughout the year, and especially during autumn with their leaves of intense yellows and reds. On this hike we visit Sarmiento, Nordenskjold and Grey lakes. man, and his paintings in the caves he inhabited, give testimony to the early interaction between culture and nature. The Ascensio River valley, surrounded by century-old forests, traces the long path toward the Torres del Paine for which this Park is named. The silence in nature, whispers of the waterfalls, and the extreme beauty of the landscape give the traveler a feeling of intimacy with Patagonia. Breathtaking views of the three sheer granite towers that form the Torres, towering above the lake, make this an unforgettable experience. We depart from lake Pehoé, hiking toward la Quebrada de la Feria where the wind has transformed the forest into bonsai-like formations. 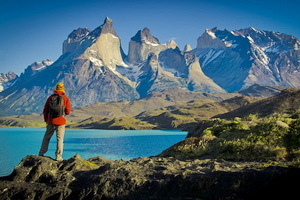 The cuernos (the antler-like three peaks of the Torres del Paine) are constantly in view. The hiking route continues toward Laguna de la Cal, and to Lagos Sarmiento which is the largest lake in the Park. The Laguna de la Cal, frozen in winter, breaks the silence with its eerie sounds of ice bending, shifting, and breaking into the water (a spectacular sight). We begin our hike toward Sierra Baguales where we will find fossils and condor nests. We follow the famed Route of Lady Florence Dixie, named for the aristocratic member of the first European “tourist” expedition to the Torres del Paine National Park. We start at a picturesque Patagonian ranch(estancia), one of the oldest in the area, where the first settlers began raising cattle. We continue bordering the vivid Laguna Verde, hiking through forests and along lagoons rich with wild birds that, during their mating season, can be seen and heard seeking mates and defending their territory. Along they way we enjoy seeing the variety of Magellanic forests. We cross Lake Pehoe by boat, arriving at the foot of El Paine Grande where we begin our hike through the Valle del Francés with breathtaking views of the Glacier del Frances (French Glacier) and the Paine mountain topped by antler-like peaks. One of the Park’s most hidden valleys, the Pingo is inhabited by baguales horses that characteristically live in valley flatlands. En route we pass through forests of lenga trees and an enormous waterfall. From the Valley we’ll enjoy privilidged views of the Paine Grande, the Cordón Olguín, and the Pingo and Zapata glaciers.